Recent developments—including the weakening of the yuan, the stock market crash, rapid credit growth, and a stalling property market—have cast some doubt on China’s economic prospects. Yet a hard landing of the Chinese economy still seems unlikely, for three reasons. First, as the Global Competitiveness Index (GCI) shows, China possesses strong economic foundations. The country ranks 28th out of 140 economies in the 2015–2016 edition. China has achieved near universal primary education and high levels of public health, invested massively in transport and energy infrastructure, and ensured a relatively stable macroeconomic environment. These successes not only have contributed to China’s emergence as a manufacturing hub, they also represent assets on which to build. China’s advantages are not shared by many neighboring economies at a similar stage of development, as shown by Figure 1. Second, an eventual slowdown was inevitable, predictable, and entirely normal, given China’s impressive growth trajectory over the past two decades. Figure 2 compares China’s annual real growth rate since 1980 to the GDP-weighted average growth rate of other countries in the income group to which it belonged in each year. Since 1991, China has grown faster than its peers every year. For several years in the 1990s, the differential was almost 10 percentage points. Since achieving upper-middle-income status in 2010, the differential has been around 5 percentage points. Third, even though it has not yet abandoned the official 7 percent target, there are signs that the government has been preparing for the economy’s new phase and has been recalibrating its growth objectives from the quantitative to the qualitative. The 12th five-year plan, adopted in 2011 and covering 2010–15, had called for a rebalancing of the economy; more recently, President Xi referred to a “new normal” under which growth will be lower. Even though the economy is unlikely to experience a hard landing, the challenges and downside risks are many. 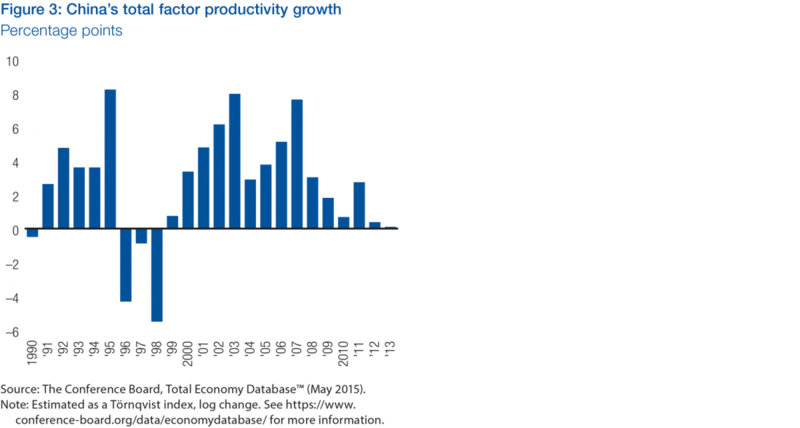 Under the new normal, productivity gains will be harder to achieve. This is reflected in China’s stagnation in the GCI rankings for the past four years. The drivers that fueled China’s growth—investment, low wages, urbanization—are yielding diminishing returns or even vanishing, as shown by the downward trend of overall productivity since 2007 (Figure 3). Future gains will have to come through more market-oriented reforms that tackle remaining distortions, controls, and rigidities across the economy and that enable more efficient use of factors of production. The GCI points to the structural weaknesses of China’s financial sector: it ranks 78th for the soundness of its banks, which have accumulated many non-performing loans. The sector is dominated by large state-owned banks, and credit flows more to state-owned enterprises or large corporations with connections than to small- and medium-sized enterprises: access to finance is rated as the second most problematic factor for doing business in China (Figure 4). A rank of 58th on goods market efficiency highlights the need to create a level playing field in non-strategic economic sectors by reforming state-owned enterprises and subjecting them to fair domestic and foreign competition, and by tackling corruption (China ranks 67th for incidence of bribery) and bureaucracy (123rd for the time it takes to start a new company). 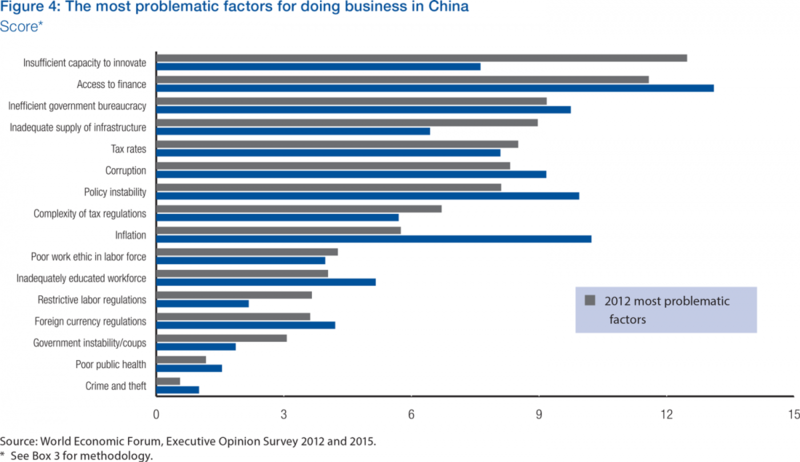 Moving beyond market efficiency, the list of the most problematic factors for doing business in China is topped by its lack of capacity to innovate, which has become a growing concern in recent years (Figure 4). Evolving from a manufacturing-based economy to an innovation powerhouse for design and R&D requires a holistic approach to the innovation ecosystem, including nurturing talent (China ranks 68th in higher education and training) and technological readiness (ranking 74th; technology is still far from universally available, let alone used). The progress that China has already made in rebalancing its economy suggests its capacity to identify and rectify weaknesses in its growth model. Since 2005, the relative importance of manufacturing in China’s economy has been declining steadily, and services now account for a bigger share of GDP.2 Meanwhile, a fledgling social safety net consisting of a healthcare and pension system, along with rising incomes and lower exports, have initiated a rebalancing of demand toward domestic consumption. 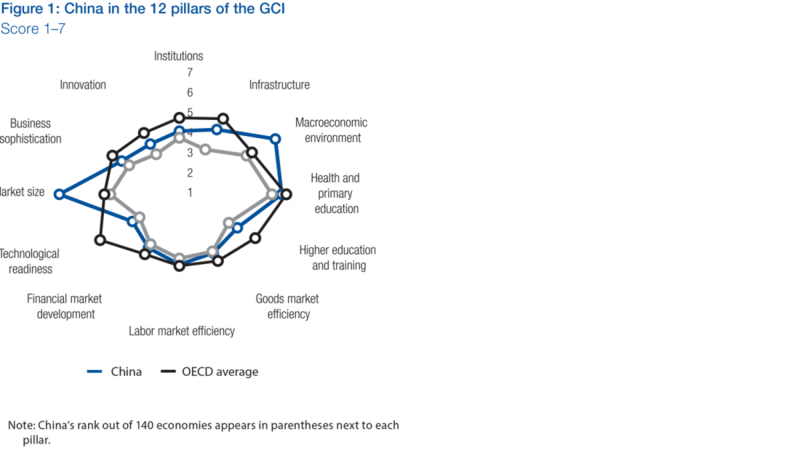 China’s “new normal” will bring further challenges in improving productivity, but its strong performance elsewhere in the GCI indicates that the country is well positioned to meet them. 1 World Bank, World Development Indicators Database (accessed September 9, 2015). 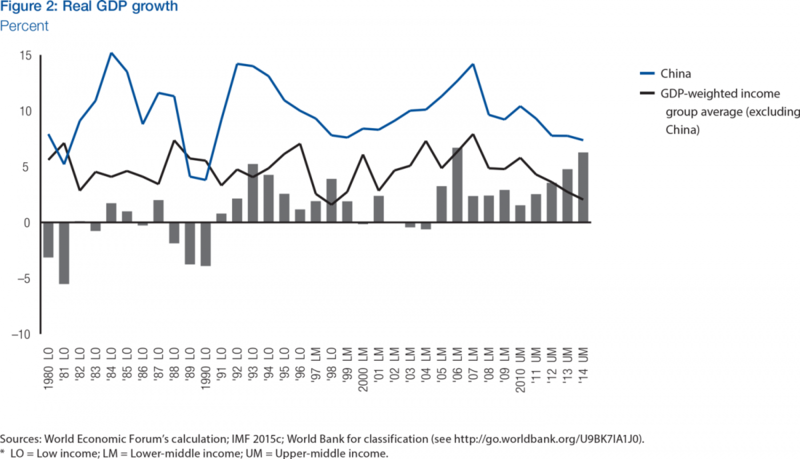 2 World Bank, World Development Indicators Database (accessed September 9, 2015).